What Does ND mean in photography? What Does ND Stand for in Photography? ND stands for neutral density and is used to describe a type of photographic filter that diminishes the amount of light transmission through a lens. A neutral density filter is designed to be as close to color-neutral as possible, so the only effect that it should have is to cut down the amount of light that is hitting your camera’s sensor or film. You might want to do this in order be able to use a wider aperture on a sunny day, to maintain a shallow depth of field, or you might do it to allow you to increase your shutter speed in order to blur clouds or moving water in a landscape photo. For more details on neutral density filers, please see the entry “What is a neutral density filter in photography”. Lots of people rely on mobile apps these days to help them calculate their long exposure values, but this can be problematic in cold weather which can often cause mobile device batteries to shut down prematurely. For this reason, I always recommend that you have a printed long exposure chart tucked away somewhere in your camera bag. 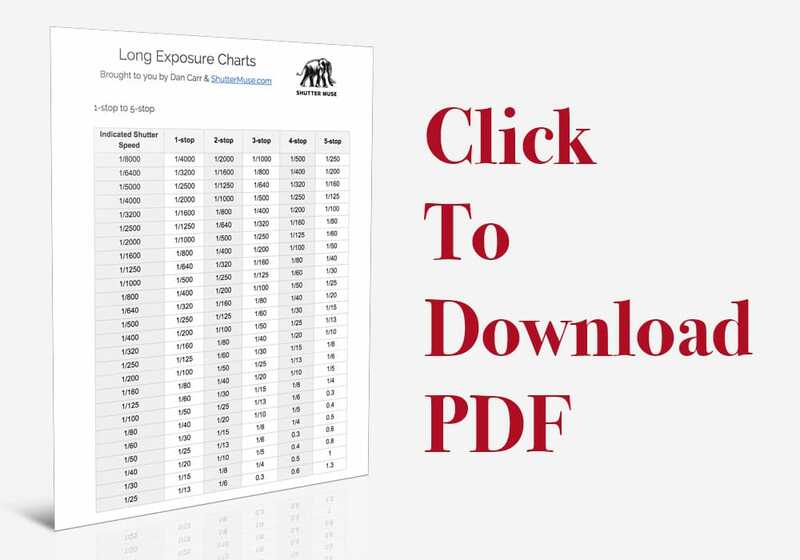 This free downloadable long exposure chart PDF is split up into several sections so that you can print the ones that are relevant to you and your selection of ND filters. 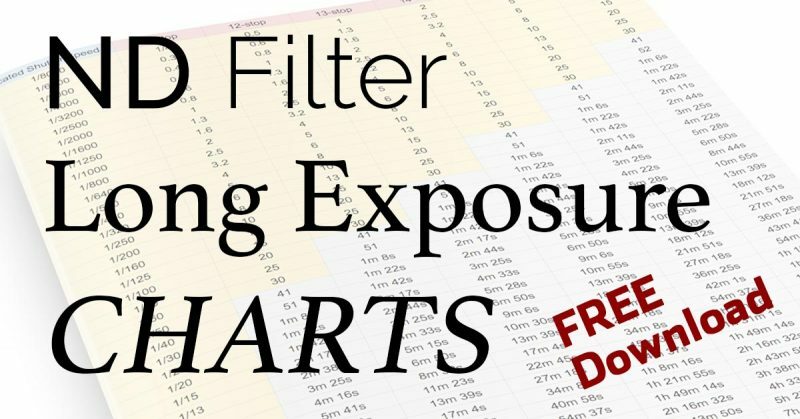 You can either choose to have the full table with all ND values, or choose pages that only show specific, common ND filter sets used by many landscape photographers.